In May 1992, the Wall Street Journal bluntly stated, “Nothing positive happens in the absence of revenue.” This statement is equally true today. An organization’s salesforce, and its effectiveness to generate revenue, can be significantly enhanced by the role of the HR function. Of the many diverse drivers of salesforce effectiveness, 2 topics are worth a brief discussion. Under the topic of People are the success profile, hiring and training/coaching of the salespeople. Under the topic of Activity Enablers are the incentive plan and performance management program. When it comes to salespeople, the chief human resource officer (CHRO) and key HR staff are seen as having a special skill in judging people and recognizing a person’s hidden talents. Whether judging a sales representative’s skills as a “hunter” or “farmer,” or judging the skills of a regional sales manager for higher management positions, human resources needs to not only consider today’s business and competitive environment, but also the future needs of the organization relative to its growth goals. In this regard, the CHRO is seen as having a special knack similar to the CFO’s skill in making inferences from the company’s numbers. In addition, the CHRO and HR staff are key in two other areas. The first is diagnosing personnel problems that may arise when the sales function is not performing well. Is it because of the mix of talent, the reporting relationships or the absence of strong, cross-functional working relationships? These are all questions to be answered. The second area is prescribing actions that will add value to the organization. For example, keeping tabs on the senior sales executives of competitors can lead to making meaningful predictions not only on how the competitors may be changing their overall sales strategy, but also on whether competitors may be looking to steal away your sales stars that fit their new sales strategy. One option for retaining sales stars is built on the long-standing premise that sales stars see pay as a personal scorecard. Some companies increase the impact of individual performance through an individual multiplier to incentive earnings. The CHRO‘s role in this area may often be viewed as limited to understanding the duties and responsibilities of individual sales positions and matching their compensation with the relevant marketplace. A growing trend, however, is for the HR function to go beyond that point and look at a broader picture. 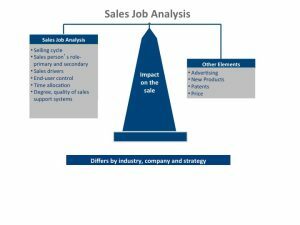 Namely: What is the importance of the sales position? What value does an individual salesperson contribute to the company? And, what should be the relevant base salary and incentive opportunity given the answers to those 2 earlier questions? In this regard, the CHRO is seen as the team leader in joint discussions with sales management, the CEO and CFO. A lot has been written about the HR function and its lack of strategic focus. Everything from its transactional nature to the many new legal aspects of the function, to a lack of budget, to not enough headcount. A recent Google search on the topic of “Strategic HR” yielded more than 250 million listings. So, there is a lot of ongoing discussion. In my opinion, there is an important reason why this perspective is not more prevalent today. The senior leadership team may view the CHRO as too HR academic and not analytical. One way to combat this notion is for the HR team to conduct some sales incentive plan analytics that depict the performance level of the current plan. For example, comparing the actual distribution of performance across the salesforce with the expected performance and then determining if these results correlate with the organization’s financial performance. Likewise, the HR function could begin to develop an analytical or behavioral-competency-based success profile of the company’s superior salespeople in order to improve sales effectiveness and efficiency. Ask to attend meetings where the CEO and CFO discuss not only quarterly results, but also talk about the company’s strategic plan and objectives. Take note of areas where the salesforce will be important for success (e.g., a new product introduction in a B2B marketplace). Collect data about the results of recent key activities that involve the sales function and use analyses to improve the working relationship between sales and other functions. For example, collect and analyze data on successful new product introductions and the interaction of the salesforce with marketing, engineering and other important functions seeking to improve the existing structure and/or processes. Contents © 2016. Reprinted with permission from WorldatWork. Content is licensed for use by requestor only. No part of this article may be reproduced, excerpted or redistributed in any form without express written permission from WorldatWork. Last week businessman, Donald J. Trump was elected the 45th president of the United States. To many, the election’s result was unprecedented and unpredictable. This month’s Compensation Alert will summarize current writings on total rewards changes that may occur under the new administration. Trump’s issues on total rewards include a mix of pro-business positions and some novel approaches to policy changes. Trump has said that the federal minimum wage should be raised to $10 per hour, but that “states should really call the shots.” Changes to minimum wage laws appeared on the ballot in several states during this election, including approved increases in Arizona, Colorado, Maine and Washington state. It is conceivable that Trump could take action at the federal level as he has toyed with the idea. Quite likely liberal-leaning states, such as California, will continue to push for a minimum wage increase, while states such as Georgia, Texas and Virginia will keep it at the federal minimum. Trump supports rolling back the new U.S. Department of Labor overtime regulations scheduled to take effect on December 1st. At this point, most HR observers believe President Obama administration’s overtime rules will proceed as planned. Although the president-elect has previously opposed the changes, he may not take immediate action to revert them. On the other hand, Congress may very well step in and propose its own changes. Trump’s plan to enhance child-care would allow working parents to deduct dependent care expenses on their income taxes at rates higher than the current deduction. His plan also would allow dependent care savings accounts and would incent employers to provide child care in the workplace. Trump’s child-care plan also includes six weeks of paid leave for new mothers. Note his proposal is silent pertaining to fathers. Trump has called for substantial changes to the Affordable Care Act (ACA), and has openly campaigned to “repeal and replace Obamacare.” A recent survey of HR participants reported that this is the top policy concern to contributors. However, Trump has recently said that he is in favor of current provisions retaining children until age 26 and covering preexisting conditions. Congressional Republicans at the same time appear to favor repeal of the Cadillac tax, the expansion of HSAs, and a repeal of individual and employer mandates. If you would like to discuss these changes further, please contact me at nlappley@lapppley.com or (847) 864-8979. And feel free to forward this email to anyone else who may be interested. We are pleased to announce the launch of a new web site. We encourage you to take a look at www.lappley.com. Please provide feedback and pass it on to anyone you feel may be interested. As we communicated in last month’s eNewsletter, salary increase budgets are expected to remain at 3 percent for 2017. Employers are turning to variable pay to reward employee performance. incentives based on individual, team and organizational achievement, rose to 84 percent in 2016, reports WorldatWork in their most recent survey of its members. This number has been hovering around 80 for many years. A combination of awards based on individual, business unit, and organizational performance continues to be the most prevalent type of variable pay program. The percentage of participants who indicated that their organization uses all three, or just one or two, of these programs is shown below. Some employers offer multiple variable pay programs covering different employee groups. In deciding whether to offer a combination of variable pay programs or to provide awards only for business unit or individual performance, it is important to answer this question: What do we want to accomplish with our variable pay programs? In some organizations, different employee groups are motivated by different rewards strategies. In other cases, a company may have an overriding culture of winning or losing together, in which case a common incentive program for all employees will support that. Also, employers should keep an eye on the practices of companies with which they compete for talent. Most organizations that have a formalized incentive program budget, as it often includes sizeable cash expenses. Survey respondents differentiated their current and planned variable pay awards representing a percentage of base pay, by employee classification. Companies striving to be known as an employer of choice often offer incentives at lower levels to attract better talent or to attract high performers at above market pay rates, which aids in retention. But always check with the objectives that you want to accomplish. Please contact me at (847) 864-8979 or at nlappley@lappley.com to discuss variable pay programs. And forward this email to anyone who may also be interested in these projections. According to recent surveys conducted by WorldatWork and the Hay Group division of Korn-Ferry, U.S. employees can expect to see a moderate 3 percent salary increase budget in 2017. This figure is consistent with actual pay increases of 3 percent reported by surveyed companies in 2016. These projected and actual salary increases have remained nearly constant over the past several years. Likely this trend (or lack thereof) reflects employers’ consistent conservative increases in salary’s fixed costs. 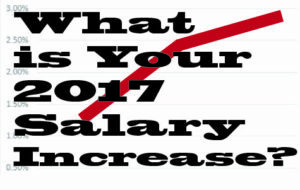 There is also consistency across most employee groups in regard to salary increases. All employee groups – from clerical to executive – are indicating about a 3 percent median increase. A 3 percent average salary increase does not mean all employees should expect to receive that number. Organizations at the 90th percentile report planning on a 3.5 percent average increase, while the 10th percentile is planning a 2 percent increase. Also, survey participants see top performers receiving between 1.5 times and 2 times the median salary increase. As a result, top performers could receive salary increase of 6 to 8 percent. There has been upward pressure on wages, due to the lowest unemployment in seven years that many economists are calling near full employment. In addition, changes to FLSA regulations and minimum wage increases will likely add to pay increase pressures. Yet many organizations appear uncertain of their economic outlook. This coupled with relatively low inflation is causing many organizations to keep growth in fixed costs, such as salaries, in check. Our recruiting and search friends are finding it increasingly hard to find and attract good talent. Companies should continue to be aware of compensation market trends as competitive situation can change quickly. Base salary increases are being awarded to 89 percent of employees in 2016 on average. Thus, most employees are receiving salary increases. Promotional increases were awarded to 8 percent of employees in 2015, a small .1 percent increase from 2014. The size of the average 2015 promotional increase was 8.4 percent. In addition, the planned amount that organizations spend on promotional increases in 2016 is 1.5 percent of total base salaries. Organizations seem more willing to provide additional compensation through short- and long-term incentive programs. The percentage of organizations using variable pay rose to 84 percent in 2016. A combination of organization/unit success and individual performance continues to be the most prevalent type of variable pay program. In addition, employers are increasingly dependent on referral, sign-on, spot and retention bonuses as ways to reward employees. Please contact me at (847) 864-8979 or at nlappley@lappley.com to discuss planned compensation actions for 2017 and forward this email to anyone who may also be interested in these projections. 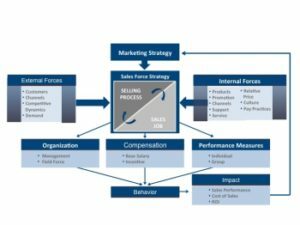 The focus on sales compensation is understandable as selling is, by far, the most expensive part of strategy implementation for most companies. Five times the expenditures on all media advertising; 20 times larger than the money spent on all online marketing and advertising in 2013. Here are five areas to test your plan. Focusing on these areas can help you determine whether you have problems. In todays hurry-up world, quality often is not given enough emphasis over a quick answer. A holistic approach is needed to ensure that proper time and thought are given to plan design and any potential unintended consequences. As one CEO remarked that the company took its time to ensure “…we didn’t have sales compensation becoming disconnected from the overall financial result of the business”. The CEO wanted to ensure that the company was paying for the right strategic results. The basic premise is that a sales compensation plan does not exist in a vacuum…as illustrated in the graphic above. Setting the same percentage of base salary as the incentive for target performance for all sales positions is often evidenced in plans. Careful sales job analysis should be undertaken to properly reflect each position’s impact and influence on a sale. This analysis then becomes an important part of determining the right pay mix per sales position. In this case, the design allows too many sales reps to max out on incentive earnings. This result can cause the CFO to worry about the inherent risk in the plan’s design or to “pushing” fourth quarter sales into the first quarter of next year. While 60 percent of the sales force should achieve quota or above, a recent survey stated that only 4 percent, on average, maxed out. If your result is significantly higher, then multiple analyses should be conducted to determine the reasons (e.g., Quota and territory design analyses). While communicating management’s goals to the field, too many measures or objectives result in the measures receiving little or no attention. Four should be the maximum number of incentive measures. This statement is backed up by a recent Hay Group survey of 700 companies that reported 85 percent of respondents had 4 or fewer incentive measures. Also, any single incentive measure or objective accounting for less than 15 percent of the targeted incentive opportunity is simply wasted. To quickly increase sales, a company may decide to provide a higher leverage of incentive to total cash or an uncapped incentive opportunity vs. the past design. This action may produce significant risks in terms of cost control, uneven production scheduling, or even upset key customers due to delivery issues. Increase the minimum weekly salary to $913 ($47,476 annually) to be considered exempt. The current limit was $455 per week or $23,660 annually. Increase the highly compensated employee exemption total compensation to $134,004. The current threshold is $100,000. Establish a mechanism for an automatic update of salary limits and thresholds every three years. Amend the salary basis test to allow employers to use nondiscretionary bonuses and incentive payments (including commissions) to satisfy up to 10 percent of the new standard level. The effective date of this final rule is December 1, 2016. 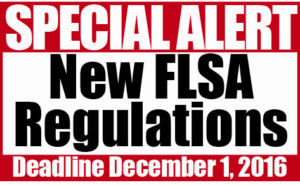 Employers need to consider the many issues, decide on a course of action, and then have all programs and documented policies in place by this December date. Failure to be in compliance with the new requirements can result in significant employer liability. The changes outlined in the final rules will likely impact financial results, human resources, and information systems. 1.Which employees will be affected? Gather lists of employees that are currently classified as exempt and have annual salaries below $47,476. 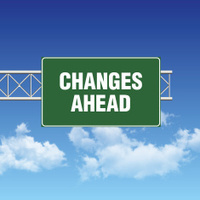 3.How will these changes affect your employees? Not all employees will view the changes as positive. Many companies will need to decide whether supervisors who are changed to non-exempt will maintain managerial responsibilities. Engaging with your employees to understand their issues and answering questions they may have will be appreciated and beneficial. 4.How will these changes impact your compensation and incentive planning and administration? Take a look at your current salary structure and job slotting. Increasing wages for employees in certain salary grades may create compression problems between grades. Also, look closely at your nondiscretionary incentive and bonus payments to see if the amended salary basis test helps you satisfy the standard salary test. Simply reply “Let’s Discuss” to this email if you would like to discuss your FLSA compensation issues or wish assistance with a mid-year review. Please feel free to contact Tim Weizer at (312) 479-6411 or tim@salescne.com or Neil Lappley at (847) 864-8979 or nlappley@lappley.com. Please also forward this email to anyone you feel will be interested. A recent client engagement underscored the need and importance of using an online tool in reviewing a sales incentive plan and making recommendations for improvement. The company is a middle market company located in the Midwest. It offered the B2B markets a high quality and premium priced product line. In recent years, there were multiple changes in the sales leadership and several changes to the design of the sales incentive plans. The primary issue was that while sales revenues had increased 7.5 percent in 2015, the sales incentive payout was more than 200 percent of the previous year. The company needed to implement a sales incentive program for the long term that also fit their immediate needs. The six-step approach we used is summarized below. Note that in Step 1, we included the use of an online salesforce effectiveness survey to solicit the opinions of both sales associates and perceptions of the senior leadership team of the company. Topical. Contains questions on important topics including: product quality, marketing efforts, quota setting, sales associate training, sales strategy clarity, incentive earnings potential, and time allocation (now and should be). Inclusive. Able to get input from all the sales associates, rather than from selected interviews. Comparative. Time allocation results compared to overall benchmarks. Quick. It could be completed within 10 minutes. Anonymous. Participant asked to check off whether he or she was a sales associate or executive. A reality gap exists. Except for product quality and sales associate proficiency, there was little agreement between the ratings by the sales associates compared to those by the leadership team. A gap is not unusual. This gap, however, was wider than we have seen in many uses of this tool. Sales Associates view their incentive plan as moderately fair, motivating, and competitive to the external market. The allocation of time for travel was a major differentiator. Sales associates said they should travel 24 percent of the time, while the executives felt that only 5 percent should be needed. The online salesforce effectiveness tool’s results were helpful in three ways: First, the role of the company’s key sales position was not reflected properly in the incentive plan design resulting in the pay mix having too much leverage vs. the position’s role. Second, account retention was seriously underweighted vs. new account acquisition. Third, the company’s limited marketing efforts were insufficient drivers in the selling process. The next time when conducting a sales incentive plan review or redesign consider using a salesforce effectiveness survey. You will be surprised at your important discoveries or just pleased with confirming data. Both outcomes will increase design effectiveness and improve your sales incentive plan. We welcome your feedback on our Salesforce Alert eNewsletters and would like to talk with you further regarding your salesforce experience and input. Please feel free to contact Tim Weizer at (312) 479-6411 or tim@salescne.com or Neil Lappley at (847) 864-8979 or nlappley@lappley.com.